I got railings on my deck. The drywall hanging is done (mudding and sanding will now commence). The stone siding is about half-way through. The garage floor will be poured tomorrow. Sounds awesome right? I’m finally getting to the point where I can spend some serious time at the house. Why then, am I so upset? 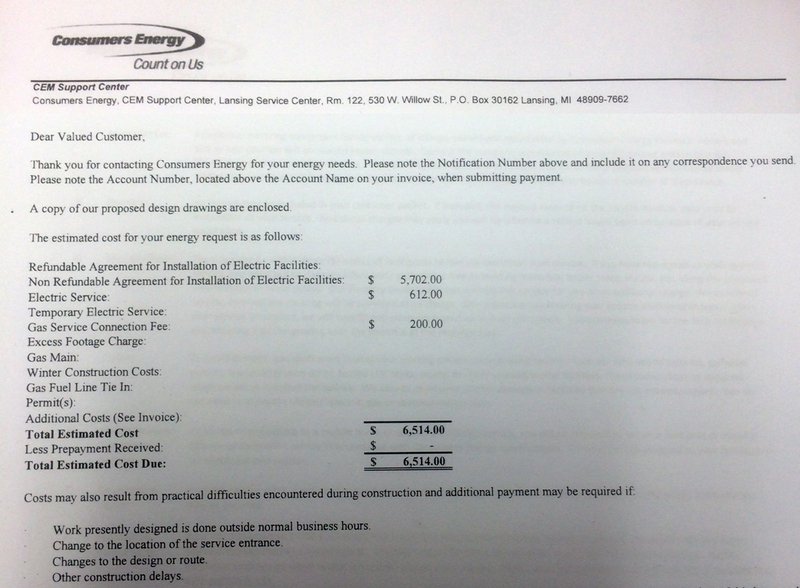 Because I got a bill from Consumer’s Energy. Me: I’d like to put electricity in my house. We’re getting ready for drywall and flooring and all that and electricity would help things move faster. Plus summer’s coming. Them: Ok. We can do that for you. Would you like the line above or below ground? Me: What’s the difference in price? Them: It’s $4.50 per foot. Me: Oh. My house is only about 60 feet off the road, so I’m looking at maybe an additional $300? Them: Something like that. With tax. So I figured the cost would be something like $300 plus an activation fee. Sort of like when you buy a smart phone for the first time. Except it ended up being exactly like buying a fancier phone. Can’t see it? You should be able to. It’s much larger than $300. If they decide to charge me more later, they can absolutely do that. When I called them, here’s how it was explained: they cannot make an overhead line because there are too many trees around, so it must be underground (I’m not complaining about the few hundred dollars that I already agreed to). However, they can’t just connect to the lady next door. They have to go two houses down, dig down the street, then under the street to my property, then south to a pad transformer (that I’m paying for), and then 131 feet to my house. I was told to be thankful because I was actually only paying a percentage of the cost. I don’t understand. Doesn’t the government, because electricity is a necessity, regulate this? Why wouldn’t this be free? Why wouldn’t my taxes pay for this already? Or – if they don’t get tax relief – why isn’t this simply worked into my bill? Consumer’s Energy will be getting paid from the second they turn my power on until was stop using centralized electricity in Michigan. The day Elon Musk creates a technology where we don’t need a power line connected to the house is the day Consumer’s Energy will stop getting paid. I could die tomorrow and Consumer’s Energy will still get paid every month. Jesus could come back, the zombie apocalypse could begin, WWIII could break out, we could have a black president and Consumer’s Energy will still get paid every month. I budgeted about a grand for this. Anybody have $5500 I could borrow?